Been Paleo for about 6 weeks. When I first started, I had fewer bowel movements but they were usually dark in color and solid/clearing movements. I'm still having solid/clearing movements generally, but lately they have been orange in color. This is a pic of what I passed this morning. 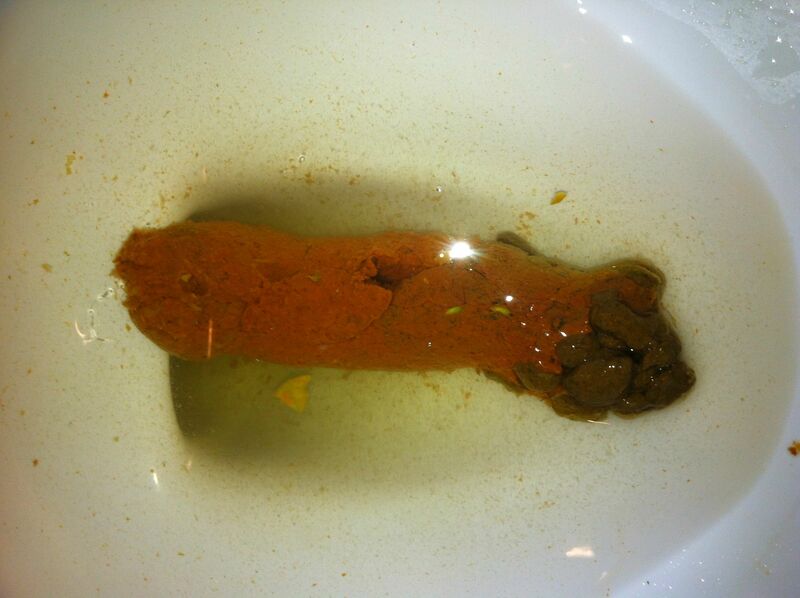 You can see it started off a "healthy" brown color, but turned into a very light orange. Anything to worry about? Anything I should change about my diet? The meals leading up to that included salmon, grass fed ground beef, apples, bananas, cauliflower, green beans, sweet potato, and tuna. I did notice there were pieces of apple peel in there. Is that not digested? Or is that something to be concerned with as well. Ha how long did it take to normalize? Nothing is wrong with you...curiosity got the best of you! a stronger indicator of crohns is green, do you have crohns in the familY? what made you think of that? there are many other more indicators of crohns, immflamation is one...do you have issues with this? Yeah, I was joking. You only have to visit Germany to see the "poo shelf of doom" in every toilet to realise that some cultures derive more information from feces inspection than others. First thing I thought was crohns.I'm dealing with the probability of it right now, and my poop is all over the place,depending on how clean my diet is,and whether or not I take my vitamins. There is a "rate my poop",but I'm totally claiming"Hack my dookie"
I'm guessing it's the sweet potatoes. I feed my dog baby carrots as a snack, and they come out looking like....chewed up carrots. Hey, man: I've heard one of the first things Ghandi would ask people about was their bowel movements. It's totally a traditional indicator of health! Do you have a url for poop hackers? What makes me nervous is that I still clicked on the link even after you warned that it's a picture of poop. What's wrong with me? Raw foods can be difficult to digest, and yes including the peel on apples (I always peel mine for that reason). I often find if I'm consuming lots of carrots thats the color i will see, I love carrots so I can overeat them very easily. I personally have thought my gall bladder was not working properly, but in the last couple months I've been on a eating plan to improve that and I've seen improvement. I don't think there is anything particularly wrong here, just be aware that the foods you eat, the changes you are making and the state of your digestion all play a role in whats going to come out. If you want me to look at your poop you have to send me $50, I don't look at anyone's poop for free. OK, at the risk of seeming bizarre, I looked at the picture. I did this becasue as I've changed my diet over the last year + I've experience many phases of poop types. Based on that, I have a theory and feel compelled to offer it in an effort to give back to the community. The first brown part that is, shall we say pebble-ish, has moved more slowly through the colon and had the water content of it reduced significantly. My poop usually looks like that and I'm normally a bit constipated. If you were at all dehyrated recently that can also cause really low water content poop. The follow on just looks as though you may have eaten something that sped up its passage through the colon and it arrive at the umm ... exit ... before having as much water removed from it. This happens to me if I go a bit over my body's fat processing capability. This happened quite a bit when I first start my 70% fat content diet. Things can move REAL fast if that happens. As to the color, who knows, sweet potato, perhaps? This is all just based on my own observations so who knows. Personally I wouldn't worry about it. What's wrong with it, is that you're showing a picture of it on the internet! (I presume, I'm too squeamish to click on the link). Looks to me like the dividing line between two meals that were very different from each other. I wouldn't worry about it. This is not poop hackers...and no I did not look.